I betcha you’ve heard the song by Connie Francis. No? Well have a listen on Youtube along with the opening credits and then come on back and watch the vintage trailer. 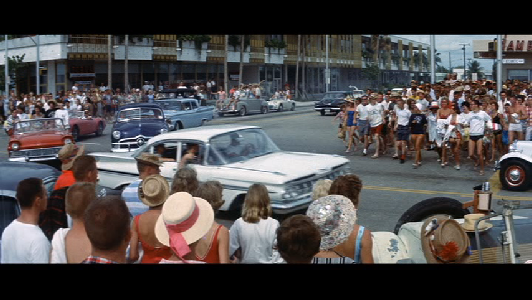 Both Swarthout's book and the film were huge hits, basically putting Fort Lauderdale on the map. 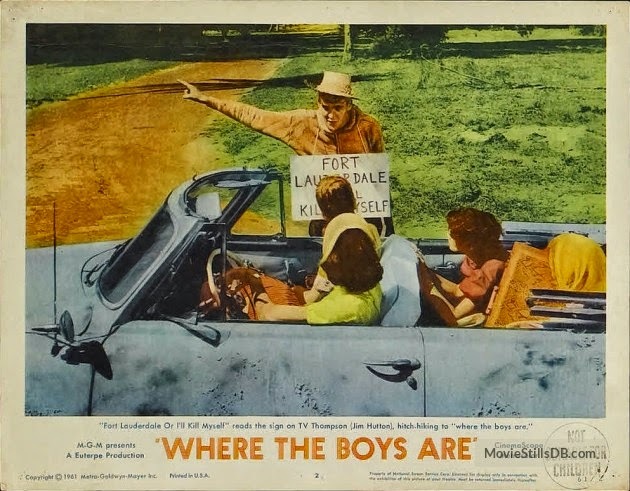 You can stream Where the Boys Are on Amazon, Vudu and GooglePlay. Including Where the Boys Are and The Homesman, Swarthout wrote 17 books before he died in 1992. Most of them were westerns, several of which were adapted for the screen, including The Shootist and Bless the Beasts and the Children. Lots of you have read my post about the Costume Design from The Homesman. 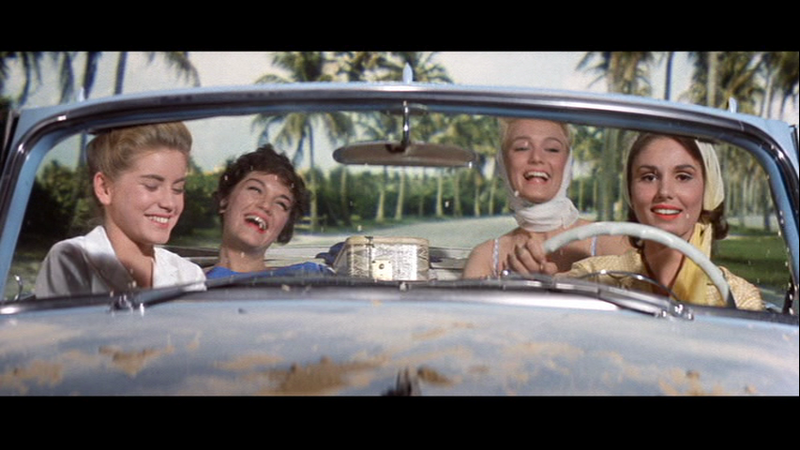 I'd totally forgotten that Where the Boys Are is set in Fort Lauderdale, spring break capitol of the USA! Good thing Spring Break is over because hubby and I are flying in to Fort Lauderdale en route to the Keys this weekend! We plan on stopping by the corner of Las Olas Blvd and North Fort Lauderdale Beach Drive where the above scene was shot; hopefully it won't be full of college kids. We also want to hit the Wreck Bar, a kitschy 'dive bar' located inside the Yankee Clipper Hotel at the south end of Ft. Lauderdale Beach. According to the Rum Connection, the Wreck Bar is one of the last remaining bars to feature mermaid shows —apparently that was a 'thing' in the 50's, and hasn't changed all that much since its appearance in Where the Boys Are. In the film some of the kids fall into the pool and, you guessed it, hilarity ensues. 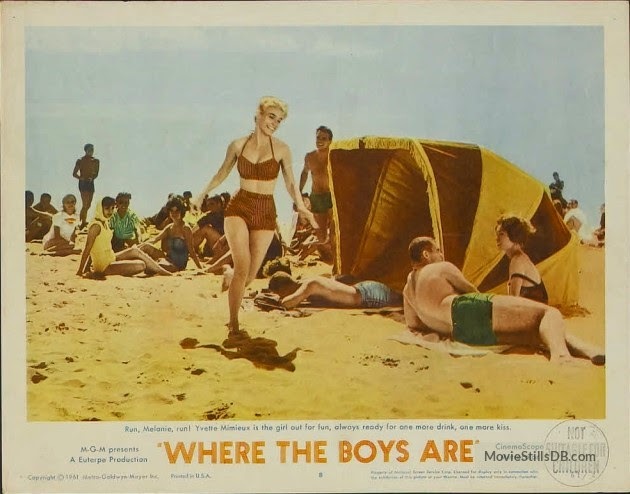 While the movie is billed as a comedy, and set in a time when women went to college mostly to find a man, there's a darker side to it as well. I won't spoil it for you but it's a side of male/female relationships that still exists. Here's that vintage trailer I promised you. Enjoy.